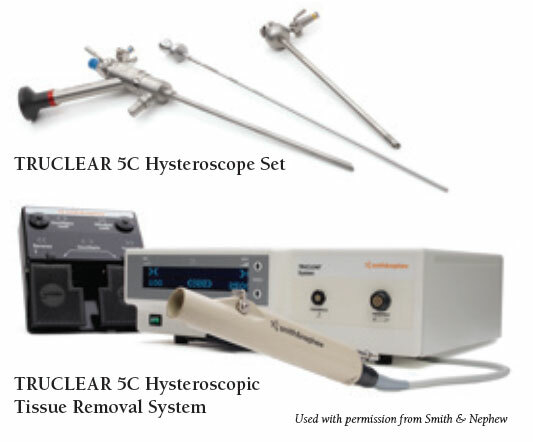 The TRUCLEAR 5C Hysteroscope Set device is smaller than previous devices, measuring just 5mm instead of the more common 6.25mm or 7.25mm devices found in the operating room (OR). In addition, says Dr. Estes, the TRUCLEAR device is tapered, allowing for easier insertion and an improved patient experience. Although FDA-approved in early 2016, the TRUCLEAR 5C is currently restricted to facilities with the greatest degree of experience in performing both hysteroscopy and in-office procedures. Hershey Medical Center was selected for this reason and as well as its broad array of subspecialists. “Outpatient hysteroscopy is a good option for many patients,” Dr. Estes concludes. “It allows them to return to normal activities in a very short time with minimal discomfort. It’s also a good opportunity for clinicians to offer a low-risk procedure, as well as enabling them to be more responsive to the changing needs of their patients.” She is encouraged by her own experience with the new device which, to date, has seen a 100 percent success rate with no complications. FELLOWSHIP: Reproductive endocrinology, Brigham and Women’s Hospital, Boston, Mass. RESIDENCY: Obstetrics and gynecology, Abington Memorial Hospital, Abington, Pa.
Gambadauro P, Navaratnarajah R, and Carli V. Anxiety at outpatient hysteroscopy. Gynecol Surg. 2015; 12(3): 189–196. Kremer C, Duffy S, and Moroney M. Patient satisfaction with outpatient hysteroscopy versus day case hysteroscopy:randomised controlled trial. BMJ. 2000 Jan 29; 320(7230): 279–282.